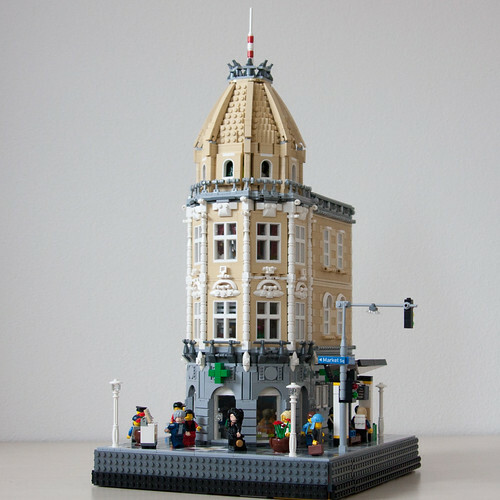 Brick Town Talk: Good for What Ails You - LEGO Town, Architecture, Building Tips, Inspiration Ideas, and more! Market Square - (BTT) It's officially cold and flu season, and this year is a real doozy. It's such a horrible and helpless feeling to be sick, but thankfully this classically detailed beauty of a building has you doubly covered. On the ground floor is a pharmacy, perfect for when you realize that all the chicken soup in the world isn't going to cut it and you need some real medication to see you through the day. Of course the best way to know what you need is to actually visit your doctor, and as luck would have it several can be found on the floors above. Science may never find that cure for the common cold, but I suppose a runny nose is a small price to pay for architecture this good.